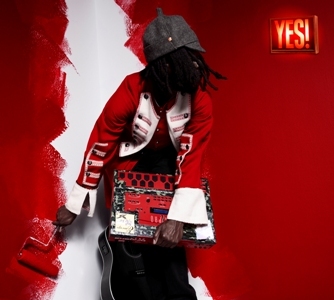 Canadian artist k-os has just released his new album, Yes! on iTunes via his imprint Crown Loyalist Recordings. The CD version will be released on April 21 through Nettwerk/Universal. However, it seems that U.S. fans won’t get a chance to purchase the disc except on import; for now there are no plans to release it here. K-os’ uniquely subversive hip hoppy twist on popular music and culture is not surprising considering that over the past decade, he’s regularly synthesized a stunningly progressive musical gumbo of hits. Having to his credit two certified platinum-selling albums (“Joyful Rebellion”, “Atlantis”) and one gold one (“Exit”), he’s also won multiple Juno Awards (2003, 2005), MMVA’s (Much Music Video Awards, 2004), Canadian Urban Music Awards (2003, 2004), a Source Award for Best International Hip Hop Artist (2003), and even garnered a Grammy nomination in 2005 for his collaboration with the Chemical Brothers on “Get Yourself High”. This entry was posted in News and tagged K-os, Nettwerk. Bookmark the permalink.